Since 1999, Rural Voices Radio has been demonstrating that “digital” is an environment where young writers feel a sense of ownership from which they can connect with topics that have always had the power to inspire–in this case the power of Place. What is Rural Voices Radio? Rural Voices Radio is a series of thirty-minute audio anthology programs that feature students and teachers reading their original poems, stories, and essays about the places they call home. Each program combines writing from a different rural area of the United States with local sound effects, music, and narration to capture the flavor of a particular region. The National Writing Project started Rural Voices Radio in 1999 with programs from Arizona, Louisiana, Michigan, Nebraska, Pennsylvania, and Washington State. In 2001, Maine joined with Louisiana, Mississippi, and far-off Hawaii to create Rural Voices Radio II, and in 2003, the National program concluded with Kentucky, Nevada, North Dakota, and Texas. However, Rural Voices Radio turned out to be much more powerful than these first fourteen programs. In 2005, the Maine Writing Project released its own program: Our Maine: The Way Life Is, and from the start we were sure that with today’s user-friendly technologies, the capacity to produce quality programs was within the reach of individual schools and teachers. In 2006, the Writers Workshop Class at Narraguagus High School in Harrington, Maine released The Sound of Maine, written and produced entirely by students, using an Apple laptop computer and the GarageBand program. Other programs by Maine Writing Project teachers and their students soon followed from towns throughout Maine. Why is Rural Voices so engaging for students? So, what is it about Rural Voices that so inspires students’ creative writing? …that makes them choose to revise? …that makes them spend their weekends recording local sounds? …that even makes them return after school is out in June to finish producing a program? First, Rural Voices uses a favorite medium: electronic sound production. Working with the spoken word softens the conventional demands of writing. The emphasis on listening honors multiple styles and talents. And, bringing different elements together into a finished program is a de-bugging process that engages students in ways not unlike gaming. In addition, Rural Voices is authentic. Whether it is published to a CD or the Internet, students enjoy a wider audience, in a format they value. At every step–drafting, selecting, arranging, and editing, the work is not just about what’s good writing; it’s about writing that serves the total program, and that’s a very real experience for these students. Finally, Place itself is a compelling and far-reaching topic. Whether listening to earlier programs or participating in the “Sense of Place” activities described below, students’ concept of place grows from something as simple and concrete as a chair in their bedroom to much more complex and abstract elements of the people they know or local traditions they enjoy each year. Part of growing up is discovering who we are and finding our place in various communities–not just the place where we live, but also the interest groups we share–family, hunters, our peer group, maybe even a community of writers. Mississippi writer Eudora Welty said, “Our place is not new, our subject is not new, our emotion is not new. Only our vision of it is new.” With Rural Voices, students recognize the audio format, the other young people who are its authors, topics that those authors have chosen, and rural culture itself. This familiarity helps them to explore new and different perspectives on well-traveled ground. For example, consider the effect of “Pow!” by Kentucky student Travis Dixon on students elsewhere growing up in a hunting-oriented community. How was Rural Voices created in Maine? In Maine, we built a social model very much in keeping with the social dimension of today’s technologies and the lives our students lead. 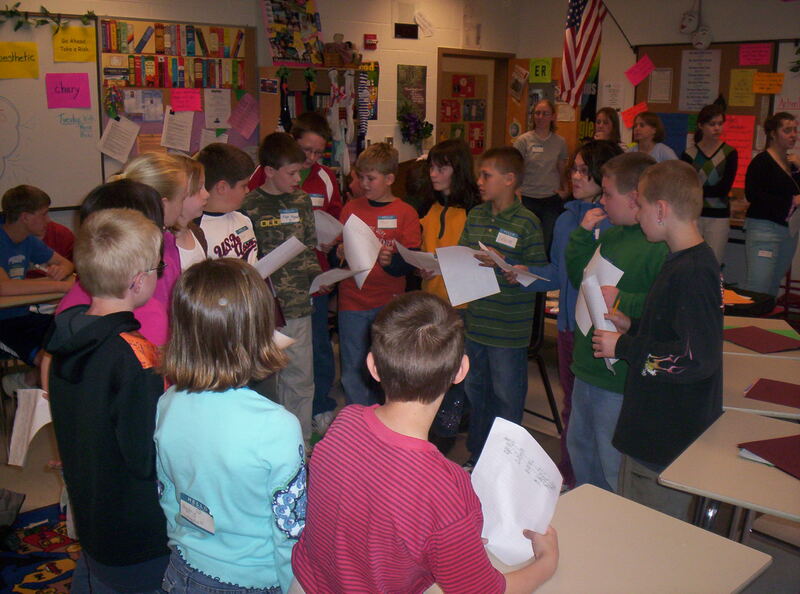 First, we had high school students lead writing workshops and conferences with elementary students. This makes the process seem less schoolish for both, and it creates a final product that is much more rich with that diversity in age. A big part of Rural Voices is helping to expand the horizons of students. Working across grade levels helps to do this because younger students are particularly receptive to what older students have to say…and older students are more reflective when they are put in a modeling role for younger students. Secondly, the mantra for our work became all writing floats on a sea of talk (Britton, 1972, p. 110). Students often have the view that writing is accomplished only by those with natural talent, working in solitude; but we believe that student writers need what all writers need: community. In the words of writing guru Natalie Goldberg, “Talk is the exercise ground for writing…a way writers can help each other find new directions” (Goldberg, 1986, p. 132-134). Words on a page come not only from keeping the hand moving, but also from stirring up what’s inside a writer. There is no direct line from prompt to writing, and the writer’s response is not immediate; it needs to be stirred up. With Rural Voices in Maine, we allowed lots of time for talk along the way to writing, and this approach spawned the conversational writing prompt. We took three approaches to generating conversation. First, “Our Town” is a poster activity in which each student puts a simple phrase about his or her own town onto a piece of poster paper. It might be, “the wharf is falling down,” or, “there are two canons in front of our town library”–concrete images seem to work best as thought starters. Then students circulate and add a comment to each of the other posters, all the while chatting about what they are reading and writing. Beginning with just one original thought from each student, the walls are soon filled with writing possibilities available to all. “Centerville” by Elizabeth Grant is an example of writing that may have come from this activity. Students quickly and easily generate their own lists of the many things they are from. As Goldberg (1986) says, “Making a list is good. It makes you start noticing material for writing in your daily life” (p. 36). Our student lists spark more conversation with more writing possibilities for all. In fact, we use an activity called Choral Montage to not only spark conversation around lists, but also to introduce students to the idea of writing as an ongoing, formative process. “I am from…” by Shawn Moleon, and “My backyard” by Bayley, Joyce, Carolyn, and Camelia are examples of writing that came out of the the list activity. Finally, we pass around various pictures that aren’t from our local area, but they might be–driftwood on a beach, a tree in blossom, a tumbling down shed. These pictures remind students of places familiar to them. They set them guessing, and as they pass the pictures around they can’t help but share the memories of places they inhabit, people they know, events they remember. A particularly effective picture topic is old houses, and “The story of my house” by John Nadeau is an example of a piece that came from this activity. Posters, lists, and photographs…Each of these activities generates the conversation these writers need to get their engines running. At some point in each conversation, it will seem right for the facilitator to say, “This seems like a good time to write,” and we will write for five or six minutes. The end result of all this activity and all this talk is two things. First, each writer has a number of prompts as well as a few beginnings from which to choose for their writing. Beyond that, each student has a broader and richer understanding of the concept of place. Countless times, I’ve watched a student progress from a particular personal space like a bedroom or a beach, to people and events, and finally to abstract concepts like traditions and values. The conversation students enjoy in our Sense of Place workshop gives them the chance to consider where they have fallen from and where they might land in understanding place in their own lives. From our conversation starters, students select one piece to develop and polish for submission to the program. Two characteristics of Rural Voices help to keep the focus on content and style–on the student’s voice–and away from editing: the oral medium, and an emphasis on “less is more.” In a thirty-minute Rural Voices program, thirty seconds is a healthy piece, and anything over a minute is considered long. In writing conferences, high schoolers mentored younger students and also learned to help each other in writing groups of 3-4 students, using a simple writing response protocol that features responding as a reader and “what if” brainstorming. One of the most compelling aspects of the national and state Rural Voices projects was that selections were made by outsiders—program producers, not students’ own teachers. Even with our local The Sound of Maine program, elementary and high school pieces were chosen by the Writers Workshop students–not by their teacher–and this makes for a new and different experience. Most authentic of all, however, is our emphasis from the start that selection is based not just on what is good writing, but on what writing serves the developing program. This will not eliminate disappointment at not being included in the final program, but it will create a context for accepting the decision and continuing on as a writer. Certainly, it is helpful to select and record an abundance of material–more than you need. From this abundance, a theme will emerge. It will actually rise up out of the material and make itself heard. Kim Stafford of the Oregon Writing Project at Lewis & Clark College compares it to building a stone walk from a pile of rocks. Like your best stones, certain contributions will be anchor pieces, to be spread throughout the program in a way that creates what we called chapters. These anchors pull supporting pieces to them and inspire the narrative thread that finally stitches the program together. In editing individual pieces for recording, our three guidelines have been to find the essence, get to it fast, and then trim, trim, trim. “A love for horses” by Amanda Brewer illustrates these three principles. It also shows that additional cuts are sometimes made between recording and final production. “Centervlle” by Elizabeth Grant is an example of the challenge of making a beautiful anchor piece as short as possible–always the goal in this audio medium. And, “I am from…” by Kalarr Dunphy demonstrates severe cuts to provide a short piece for a specific purpose like completing the program introduction. Other production considerations include mixing style and tone across the program as well as finding just the right snippet for a knot in the narrative thread. Contributions by Daniel Hayes and Joshua Ray in the opening to Our Maine, introduced above are just such special uses of a part of their writing; and “I am from…” by Shawn Moleon, also above, is an example of introducing humor, which has typically been less common in students’ Rural Voices submissions. Altogether, Rural Voices Radio merges today’s technology with sound writing practice in ways depicted in Figure 1. Rural Voices Radio itself (green, inner circle) is based on writing with an authentic purpose for an authentic audience, in a medium students value, using a process that is not only well structured and accessible, but also true to the needs of real writers. Rural Voices Radio engages students (blue, middle circle) precisely because it is “authentic”–and in best cases competitive–in both process and product: it involves a wider audience than the teacher’s red pen, relies on today’s multimedia, and places the focus on writing rather than editing. Rural Voices appeals to student’s social nature, and production increases opportunity by requiring multiple competencies. Finally, Rural Voices Radio contributes to student learning (outer, beige circle) because it models learning, and writing in particular, as both formative and socially constructed; it demands critical thought and evaluation skills in every phase; and, above all, it fosters student voice and their sense of place. It is in this last respect that it helps students to understand learning as a lifelong process in service of those recurring questions of identity and community: Who am I? And, what am I a part of? Attempts to answer these questions are found throughout Rural Voices, but perhaps no more so than in the pieces “That was my deer” by Brandon Caron, “A touch of nature” by Kayla Pleau, or “I am here” by Patrick Keith. Britton, J. (1972). Writing to learn and learning to write. In G. M. Pradl (Ed. ), Prospect and retrospect: Selected essays of James Britton. (pp. 94-111). Montclair, NJ: Boynton/Cook Publishers, Inc.
Goldberg, N. (1986). Writing down the bones. Boston: Shambhala Publications, Inc.
Lyon, G. E. (1999). where I’m from: where poems come from. Spring, TX: Absey & Company. Wilhelm, J.D. (2002). Action Strategies for Deepening Comprehension. (pp. 174-177). (New York: Scholastic Professional Books. The second Making Learning Connected (aka #CLMOOC) starts today!